Every manufacturer should always look for different ways to turn things around, as in enhancing their current line up with new models from time to time in order to make them appealing and relevant to the fast changing market, or perhaps to roll out something that is totally new and evolutionary – there are many different ways to go about a particular issue. E Fun might not be as famous as other tablet manufacturers, but this does not stop them from trying at all, and they have decided to expand their Flexx family of products even further this time around, with the introduction of three new models at the upcoming CES 2016. Forget about Android – this trio of models will comprise of the new Flexx 9A, Flexx 10A and Flexx 11A, where it will all run on Windows 10 as the operating system of choice. As for the processor underneath the hood, E Fun has decided to settle on a quad-core Intel AtomTM x5-Z8300 processor, keeping it company with 2GB of RAM, removable keyboards, dual cameras, and a multitude of ports and connectivity options. 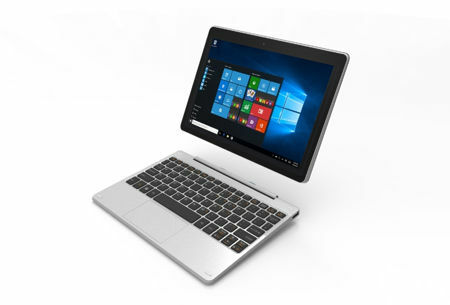 Regardless of the model that you decide on eventually, they will all be conveniently sized for use on-the-go in either tablet or laptop mode, enabling the Nextbook Flexx detachables to deliver endless entertainment opportunities. It does not matter if you are watching movies on an airplane ride, or playing Windows games from the Microsoft Store on a road trip, these Nextbook 2-in-1s are easy and fun to use. Other hardware specifications include a capacitive multi-touch screen in different sizes for different models – 8.9″ 1280×800 IPS, 10.1″ 1280×800 IPS and 11.6″ 1366×768 IPS, a detachable silver keyboard, 32GB of internal memory for the Flexx 9A and Flexx 10A, while the Flexx 11A gets double the amount, a microSD memory card slot for expansion purposes, Bluetooth 4.0 and WiFi 802.11 b/g/n connectivity, front and rear cameras with microphone, and a microHDMI port. Expect all three to ship in the second quarter of this year with the Flexx 9A, Flexx 10A and Flexx 11A retailing for $149.99, $199.99 and $249.99, respectively.